Have you ever felt like someone from “the other side” is watching over you? That is how I have always felt about my Grandmother, Madeline. I know that there are a lot of non-believers and skeptics when it comes to this sort of thing, but I will assure you that sometimes there just aren’t explanations for everything that happens here on Earth. Madeline was my Father’s Mother, who was taken from him and everyone in our family too soon on May 27, 1975. My Father was only 17 years old when she passed suddenly, which is why I never got a chance to know her. I would have been her first grandchild which is why my Father gave me her name as my middle name. When I was old enough to understand that, I began to feel connected to her and ask about her. Over the years, I have heard many wonderful stories about “Midge” as everyone liked to call her. I have seen pictures and heard tales of how she was as a person, a Mother, and so much more. I always loved hearing the stories about her and her sisters and what kind of women they were, strong Italian women that you would never want to cross! I like to think that a lot of my personality comes from her after hearing those stories. Naturally, after learning more and more about her, I would often wonder many things – such as, what our relationship would be like if she were still here. Would she tell me that I reminded her of herself when she was young? Would she be proud of the woman I was becoming? Would she and I have been extremely close? Unfortunately, I thought I would never get those answers here on Earth or would I? Around the age of 13 was the first time I knew my Grandmother was watching over me. Of course, I will spare you the details of that day, as you will soon understand, so let’s just say it was when my “cycle” started and I became a woman. There I was in the bathroom thinking, “It’s about time!” All my other girlfriends had already gotten their cycle and it was finally my “time of the month” (Lord I wish I could give it back!). It was a very exciting and scary day for me. I had a ton of questions for my friends (since I happened to be on a school-sponsored retreat, my friends were my only support around!). I could not wait to get home and share the big news with my Mom. However, in the back of my mind I quietly thought of my Grandmother and wasn’t really sure why, but I just felt like she was there with me. It was later that day when that was confirmed. While discussing this monumental day in my teenage life, someone brought it to my attention that it was also my Grandmother’s birthday. Madeline’s birthday! It was then that I first realized she was with me. From that year on, unexplainable coincidences happened to me every year on her birthday. There were even years that I would go the entire day not realizing what day it was and then, something would happen and I would check the date and sure enough, it was her birthday. It could have been something as simple as finding a penny, heads up with her birth year on it, or as strong as realizing the hospital I chose to give birth to my son was located right next to her cemetery. Of course, throughout the year, I would also feel connected to her and little things would happen here and there. But, it wasn’t until I had my son that I got another very powerful message from her! The story starts with some background so you can understand all the circumstances. 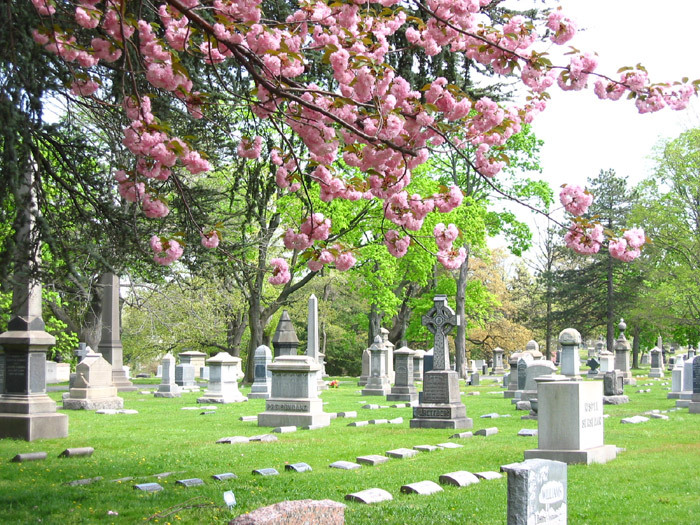 When I was a little girl, probably around age 8 or 9, my Uncle Tommy, Madeline’s son and my father’s brother, took me to Harleigh Cemetery in Camden, New Jersey. It was in this cemetery where our family decided to put my Grandmother Madeline to rest. I remember the cemetery being huge to me! It was nothing but rows and rows of headstones as far as I could see. After years and years had passed, I never returned to that cemetery or really even thought of it. To me, my Grandmother was around me regardless of visiting her gravesite. As I mentioned earlier, I chose the hospital in which my son was going to be born, and it happened to be located right next to her cemetery. Throughout my pregnancy, I would pass her cemetery, smile and think, “Hey Grandmom!” For some odd reason, I never entered it and, even if I had, I would never have been able to find her headstone that I had only visited one time as a child. To fill you in on the circumstances of my life during this time, I was 17 years old and pregnant. I was going through this tough situation alone, very young, scared, and battling panic attacks from all the anxiety of my situation. After my son was born, these emotions did not leave me. I was still young, scared and battling anxiety and panic attacks. Finally, the time came to have my son Christened. Being Roman Catholic and believing in God, I naturally wanted to have my son Christened. I called up the church and they gave me the next available date for a Christening and I took it. It was then that my anxiety and fears started. Panic attacks were running my life those days. I was terrified to stand up in front of an entire church with my new baby at such a young age. Panic started to flow through me just thinking about that day. I tried several times to talk myself out of it, but the closer that day came the more fear built up inside me. If you understood the power that anxiety and panic has over your mind and body you would understand why I just couldn’t think about standing in front of all those people even if most of them were family. Finally, that day came and there I was frozen in the front alter of my church, I could feel my heart racing, palms sweating, and I was praying hard to get through this for my son. I know it probably sounds silly but panic attacks are no joke! I saw the priest stand up and knew immediately he was about to start. I felt my stomach drop. I knew in a minute I would be standing up on the church alter, all eyes on me, and the panic attack started. Before I knew it, I was running to the back of the church toward the bathroom in fear of getting sick, but instead I just flew out the doors and ran to my car. I sat there crying, so upset and angry with myself for allowing panic to control me and now, I was missing my son’s Christening. “My Son’s Christening!! !” I screamed to myself. It was there in that instant I thought of my Grandmother. Without thinking I grabbed my key, turned the ignition and took off toward her cemetery. Hysterically crying, I drove towards her gravesite on that cloudy, cold day knowing I could be alone with her and find some comfort in knowing she was there with me – even if I couldn’t see her on this Earth. There wasn’t a ray of sun in the sky which made everything just a little more depressing and colder then usual. I finally pulled up to the cemetery and came to a stop looking out at the hundreds of headstones and the interior roads of Harleigh Cemetery that went in every direction. I sat there and cried harder, I knew this mission to find my Grandmother’s headstone was like finding a needle in a haystack. It was then that I looked up and, in the sky a perfect circle was cut out of the clouds, rays of sun shone down on one section of the cemetery in the distance. Without thinking, I drove towards the sun instead of just giving up. Maybe, I thought, I could at least sit alone in the sun to feel better, even if I couldn’t find my Grandmother’s headstone. I followed the twists and turns in the roads that lead me over a small bridge and across the cemetery. It was right when the nose of my car hit the first ray of light that the sun disappeared. I pulled my car to the side and stopped and looked up in the sky, only to find that the sun had gone away and there was complete cloud cover again. I immediately started sobbing again thinking what a horrible day I was having when a headstone caught my eye. I stared in utter disbelief out my car window! I got out of my car and walked to a beautiful headstone that bore my middle and last name. I stood there only for a second reading the headstone when I realized what day it was. It was November 20th, my Grandmother’s birthday. With all the anticipation and anxiety of this day, I had never realized the date and what it stood for. Here I was christening my son, her first born Grandchild on her birthday. I fell to my knees on the grass and cried and spoke to my Grandmother through prayer. It was there in that moment that I knew without a doubt that she was with me that day and has been watching over me my whole life. It was one of the most amazing moments of my life, and I will never forget it. Some people may think that the events of that day were just a strange coincidence, but for me, it was a wonderful moment that confirmed my Grandmother is always watching over me and that the people from beyond have the power to do so. So, have you ever had anything like this happen to you? Do you feel like someone from the “other side” is watching over you? Without a doubt in my mind and with all the faith in my heart, I know they can and do – for love never dies! Cherene - who has written 1 posts on Write On New Jersey. Cherene, this story is a masterpiece and a testament to the power of love in our lives. Beyond a name, you and my mom have a special bond that you have experienced, because you were open to it. She is your guardian and earning her wings by watching over you. Although you never knew her in this life and she you, know that she loves you from beyond and that she and all of our departed loved ones are as much a part of our lives today as they were in their time on this Earth. This is, by far, one of the most beautiful stories I have read. I find it even more amazing because I felt the same bond to my grandfather. When my mother showed me his old ledger and uniform (he was a pilot), I wondered constantly what my relationship to him would have been like if I had met him. His portrait is in our hallway, staring into my room. I believe you entirely that the bond of love never breaks and your story is glorious testimony to that fact. Thank you for sharing it. Thank you for the compliments on the article. They mean so much to me! This is a very personal story for me and some of the parts where hard to share but I have always wanted to write down this story on paper and I’m glad I did! I’ve had the pleasure to hear this story on more than one occassion. It is just as touching and moving in written form. My father also lost his mother at a young age. He was only 20 when his mom died of breast cancer, and I was just two. At the time, we lived with her and my grandfather in a tiny rancher on Indian Queen. My mother told me she insisted on rocking me to sleep each night. Although I have no memory of her, I have always felt connected to my grandmother and remember praying to her as a child. Like your gramdmother, she was born in November; only her birthday falls on the 25th. I don’t think it’s a coincidence that my son shares the same birthmonth as his maternal and paternal great-grandmothers. A few years back, after suffering my greatest lost, my father tried to comfort me by talking to me about his greatest heartbreak – the loss of his mom. He said, “I never told you this, but you remind me so much of her.” I’ll never forget how he looked at me as he said those words; I’ll never forget the meaning of such a simple sentence. We carry the lives of the dead with us always. Through us, they still live, love, and laugh. I’ve witnessed this time and time again. The signs are there to comfort us and teach us that something beautiful awaits us. Unlike you, i was lucky to have grown up very close to my grandmother; I lived under the same roof with her. She was a deeply spiritual woman, and a very strong woman as well. Although she was Catholic, her faith ran much deeper than any dogma. She passed on at the age of 93, with all of her wits and all of her glorious wit. Her name was Rose, and she grew the most beautiful, fragrant roses. I too love roses and although she grew a number of other types of flowers as well as vegetables and herbs, I always associate roses with her. I can tell you a number of stories here, all of them true, about how my grandmother has come to me in dreams after she passed, to give me support during some very bleak times, and to foretell things that later came true. These are extremely personal experiences, and I won’t share them here. We were walking down a side street perpendicular to the hospital. The entire street was concrete and steel: hospital annexes and a parking lot. There were no gardens and no flower sellers. And there wasn’t a soul on that street except for my husband and me. My dad had a lengthy recuperation, but he did indeed survive. I believe that the body dies, but not the spirit. And I also believe that love is the strongest bond between two souls and can never be broken. Thank you for sharing your comments and beautiful stories with us! I get chills when I read stories like that because it fills my soul with love and happiness knowing that we truly don’t ever lose the ones we love. They are always with us and always watching out for us! Love never dies! Thank-you for having the courage to write this story. I know that it is hard to admit being emotional. But I think sometimes we have to have chinks in our persona to be able to be accept help from the beyond. Sometimes its like we need a bit of extra love and a push in the right direction. I can relate to the fact when you went to the cemetery to look for the grave. I remember when my mom passed away and since she is buried in another state I wanted to say my last good-byes and I could not find her grave right away and I said let me find her grave and I did. I’ve personally dealt with anxiety attacks my whole life. It started when I was just a kid and I’ve had to deal with them since then. I’ve finally figured out that has helped me get them done once and for all. I will tell you that it wasn’t quick or easy, but after a while I was able to finally get rid of them. I’m back on track and its like I’ve started a new life not having panic attacks. I also saw a Dr. Oz special a few days ago, sometimes it isn’t a panic attack that is the root of the problem, I’d also recommend talking to your doctor. I wish you the best!